Ok, I apologize for my shameless shilling in advance, but mama’s gotta’ pay the rent (and the wireless bill). 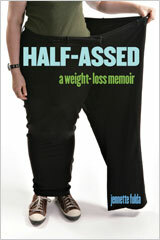 I wanted to let you know today is the last day you can get Half-Assed: A Weight-Loss Memoir for $0.99 in the Amazon Kindle store. What I wanted to add is that you don’t need a Kindle to read Kindle books. You can download the free app for a computer or your phone. A surprising number of people I know read books on their phones, which I suppose makes sense if you commute a lot or you just get bored in line at the coffee shop. I’ve read several Kindle books on my computer and don’t mind it since I spend so much time at a computer anyway. Shilling over. Regular blogging to resume shortly. Oh, and my apologies to Nook users. I don’t have any control over book pricing, but I’d give you guys a sale too if I could! oh but I already bought it. Then I read it. 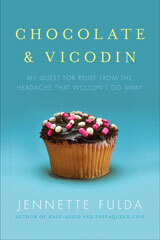 And then I just had to buy “Chocolate and Vicodin” and I am reading that one now. I love them both! You are amazing! I got your book less than a week ago for 99 cents and I am 57% done. I read every chance I have as it is amazing. I have been overweight my adult life by about 40 pounds, but I was relieved and surprised that my thoughts and fears (such as exercising in public) are exactly what you felt, as well as trying to eat like a “normal” person at functions to receive as little judgement as possible. Did I mention how hilarious you are? I wonder if lots of heavy girls are that funny on the inside but too shy to talk. If it weren’t for your sense of humor, I would be tearing up instead of cracking up every few pages. I know how desperate you felt, and I totally admire your determination! Glad you aren’t the “PastaQueen” anymore. My goal is to one day post a picture where I look like you JenFul! Love your hair on the last pic by the way. 🙂 Thanks!!! Buy her book everyone! It’s AWESOME! I bought 2 copies, one for me, one for my mom. Hi! I picked up your book on a whim (well, because it was 99 cents), and it’s fabulous. But you already knew that. And while the weight loss is so very inspirational it’s crazy, what made me laugh the most was all the comments you made about blogging. And…now I’m here. I look forward to getting to know you! You can get the Kindle app for Android and get the book that way. That’s what I did, and the book is awesome. And you aren’t shilling, you are pointing out a good source of information and inspiration for folks trying to lose weight. So disappointed that I saw this a few hours too late! I’m just checking out your blog for the first time, would love to have bought the book today. Will it be on sale again soon? I bought your book first – and then hunted down your blog :-). You’ve inspired me….great book! I had read your blog and wasn’t sure there would be much new in the book, but figured for 99 cents it wouldn’t hurt. And I was pleasantly surprised how much more insight and analysis there was in the book. I enjoyed it quite a bit. oh I missed it at the 99 cents… is there any chance of it evern going that price again? @sherry – @DAnielle – I don’t get a say in the book pricing, so I have no idea if it will go on sale again. If it does and someone tells me about it I’ll be sure to post and tweet and Facebook about it. Also, thanks to everyone who bought a copy! I really do appreciate the support. I just finished reading the book and I loved it. I loved that it said, “Everything you needed to know you could learn at the library or online.” No magic beans, pills, potions, just hard work, a sense of humor and humility and then later, results. I look forward to reading the new book and anything else you have to say going forward, you have a wonderful voice and women need to hear it. I am almost finished withyour book, and I truly hate for it to end!! I am on my own weight loss journey (have lost over 40 lb. with 30 left to go) and I can so relate to your story. You have given me so much insight..now I have to catch up on your blog. Thanks for the low price, and i love your wit & humor…you made me LOL many times! !